We here at Mason Jar Films love when dads take advantage of the wedding day to put on a display of love for their daughters. Speeches. Toasts, encouraging words, dances. We especially love when a father of the bride plans a huge surprise for their daughter, like FIREWORKS. At their swanky outdoor reception, Sidni's dad gave a really sweet toast, and afterward, he surprised Sidni with a firework show. As you can see from her facial reaction, she was genuinely surprised, and even shed a few happy tears. It was really beautiful. What a day--from cowboy boots& cufflinks to fireworks. Sidni's bridesmaids heroically made sure everything was in order in the dressing room, and as soon as Sidni arrived, everything was in its place. She gleefully opened a wedding day present from her groom, Jay--monogrammed cowboy boots! I'm not sure if that is a tradition all over the country, but here in the south, many brides and grooms send a surprise gift to their spouse-to-be by way of a member of the wedding party. Sometimes they include a letter, or something that can be worn that day, i.e. jewelry, cufflinks, shoes, earrings, a necklace. Sidni's hairstylist and makeup artist worked quickly, and minutes before the ceremony, Sidni was serenely standing in front of her bridesmaids in the most beautifully detailed lace wedding dress. 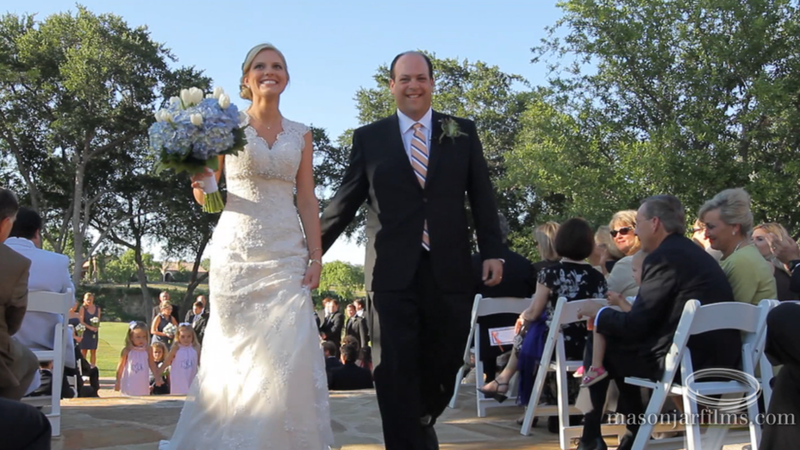 All that was left was to happily hug her dad and to begin their walk down the aisle. This is a still shot from the wedding after Sidni & Jay were pronounced "man and wife." I was really touched by how thoughtful the groom's cake was that Sidni had prepared for Jay as a surprise. 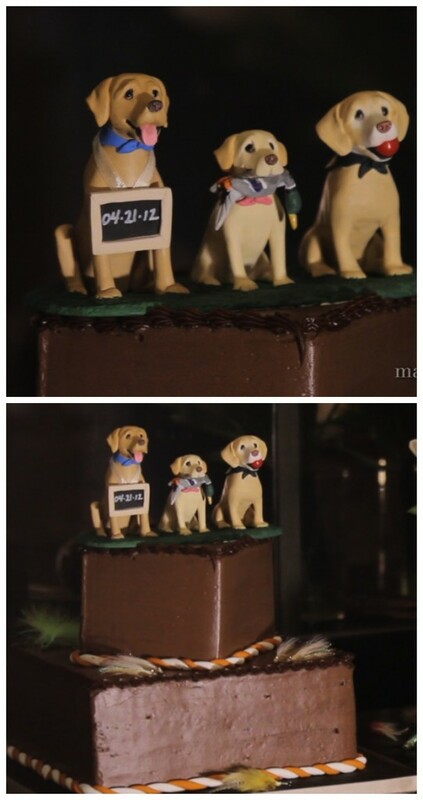 On top of the cake, Sidni had a custom cake topper made to look like each of their three dogs, and the cake was surrounding by a display of quail feathers and river reeds. 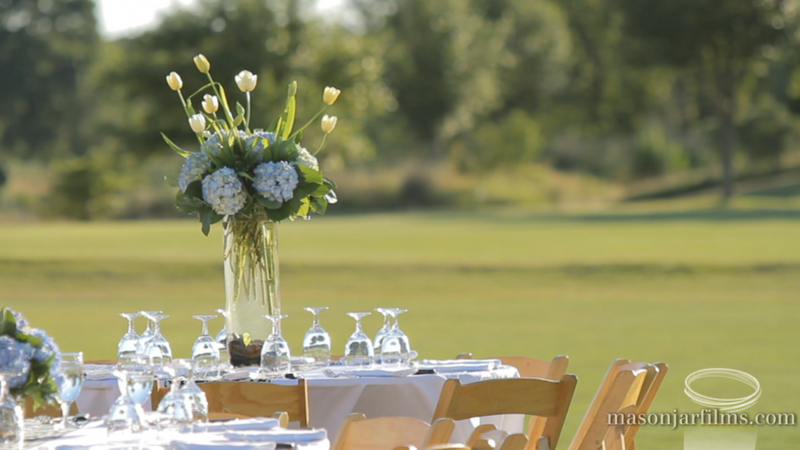 The couple loves to hunt and fly fish together, so it was a great dessert idea. Sidni and Jay, thanks so much for having us to your wedding. We loved being a witness to your devotion to each other and to your creativity during the reception.